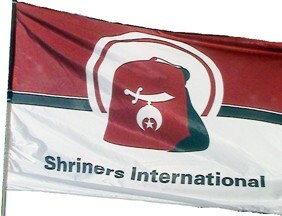 This is the flag of the Shriners International organization which was displayed at the Edmonton CapitalEx parade. I think this is mostly a North American institution, but that comprises at least two countries, so it gets the int- prefix. The Shriners are a Freemason-like organization, and are best known for the network of children's hospitals they have established and continue to support.